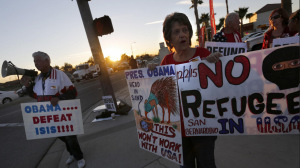 Obama / ISIS Protest in San Bernardino (Video) | Stop Obama Now!! It is bizarre that Obama can meet with families of ISIS terror victims without shame, since he is largely responsible for the rise of ISIS. ISIS grew out of his funding and support of Jihadist rebels in Syria, which included Al Qaeda terrorists. We had a protest on the opposite side of the intersection where a spontaneous memorial to the victims had been set up and got a tremendous response from the public. We called for the de-funding of ISIS by the US Congress and Obama’s impeachment and removal from office. Obama tried to slip in under the cover of darkness. But four of us were at the airport and the motorcade drove right by us within a few feet, while Raul yelled at him with the bullhorn. Photos, video and interviews were also taken by KTLA, NBC4, LA Times and Reuters, an international news service.